I stare at my toenails. They are coated in a thick layer of goopy purple nail varnish. “Perfect”. I think to myself. “No matter what revolting colours my nails go during the course of my 50 mile race, I won't be able to tell.” I just have to hope that after all my careful painting, they don't detach entirely. Imagine finding that in the end of your sock. I've made a list of all of the kit I might need and every time I pass the list written on the whiteboard in the hall another item gets added. At this rate I'll be dragging a suitcase around. I just don't know what I'll need. And what if I forget something crucial? At this point, rational thought has fled and I've lost all sense of what is 'crucial' and what is 'irrational'. I add 'Garmin' to the list. Pause and add 'Spare Garmin'. Then 'Garmin Charger', a thoughtful pause … 'Spare Garmin Charger.' 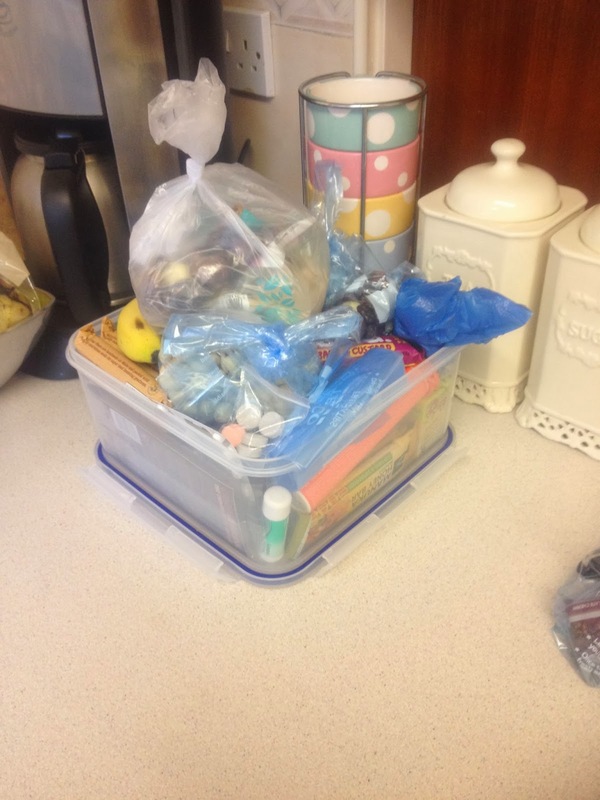 I am NEVER going to get this lot in the car. I look around. There are piles of kit laid out around the house like neon molehills. There are trainers in piles. There is a veritable supermarket of food on the kitchen counter. I am only going to be running 50 miles. In Oxfordshire. I remove a protein bar from the pile of food. Panic and put it back again. Sod it. I'll see what I can ram into the running pack and my pockets and leave the rest behind. After a fitful night’s sleep and finally dozing at 1am, an alarm goes off at 6am. This is not MY alarm. I smack The Mister in the back of the head for forgetting to turn his work alarm off and try to snooze for another half an hour until MY alarm goes off. Not happening. Casting a baleful look at The Mister, I drag myself into the shower, get into my kit and attempt to pick up my ultra vest which I packed the night before. I need both hands to lift it. Luckily most of the weight is snacks, so I resolve to start eating early on to relieve some of the weight. That's sensible planning, right? There are also 2 crème eggs stashed right at the bottom of the pack, the first to be devoured at mile 30, the 2nd is for the finish line. We arrive at the start, The Prince of Wales in Iffley, the car park in front of the pub a mass of rucksacks, buffs, nervous farts and enthusiasm. I joined a queue that was already out of the pub door and which wound its way through the pub to the registration table. I was handed a map book, a 'Supplementary Route Diversion Instructions' book (due to the heavy flooding), an envelope containing my number; '122', safety pins, and a handful of leaflets. I also had to pick up my chip but rather than this being attached to my ankle like at road races, this went on my wrist and I had to scan it at checkpoints whereupon it flashed it’s pretty lights and confirmed I wasn't taking any shortcuts. Normally I'd pin my number to the front of my vest but today I was wearing multiple layers with an ultra vest on top. I looked around. There were multiple variations. A lot of people had them pinned to their legs. Not an option for me. Being so short, it’d come to my knee and I'd look as though I was wearing a pair of strange one-legged Bermuda shorts. Or halfway through constructing an outfit from newspaper. If I put it on my chest like usual I'd be unable to remove my pack and therefore get at snacks. Not an option. I compromised by putting it on my stomach across the jacket zip. I wouldn't be able to remove the jacket without stopping but it was February. Unless the weather did something REALLY dramatic I wouldn't need to. I met up with Rod and Paul in the bar of the pub. We'd arranged to start running together and would decide how to play it after the first few miles. 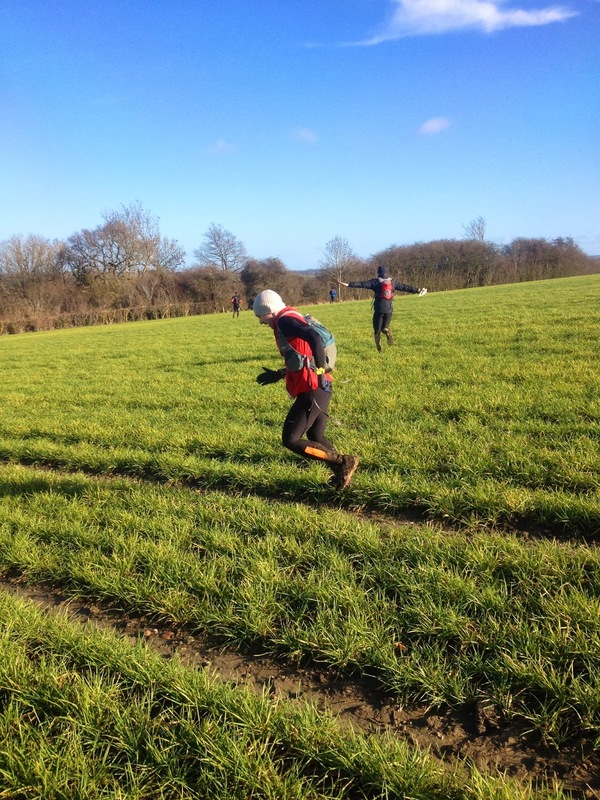 Rod was an experienced point-to-point ultra runner (and has a 100 mile race this year!) whereas Paul and I had run lapped courses but this was our first A-to-B ultra so we didn't know what our paces would be like. Or our feet. I was also concerned about my stomach so had a length of loo roll safely and secretly tucked into my pack. 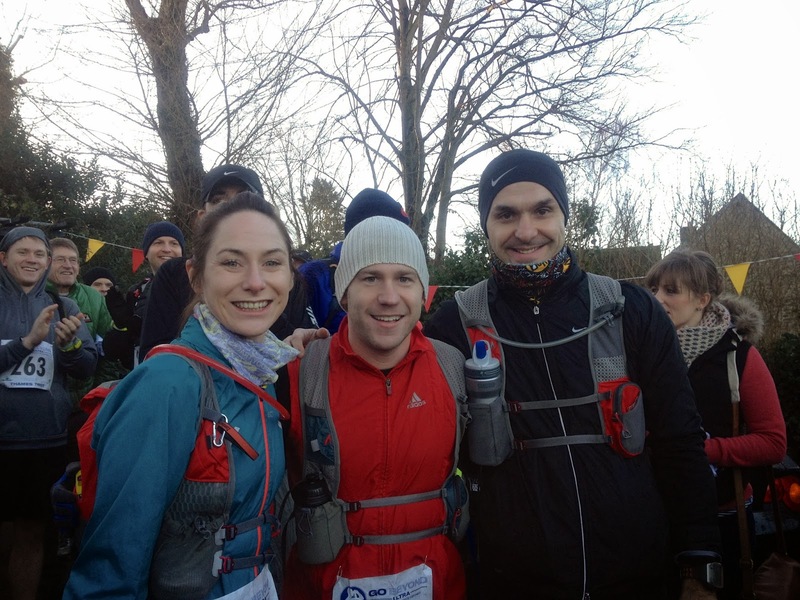 The Thames Trot was a brilliant place to catch up with Twitter friends and I was pleased to meet up with Andy who is a very experienced Ultra runner who'd completed #SPW, #TP100, and is running Comrades 2014. He also swapped me a pack of chocolate coffee beans for some Chia Charge flapjacks. Good trade. Another runner who was very pleased to meet with was Taff Tanner who was running TT50 with a friend of his. 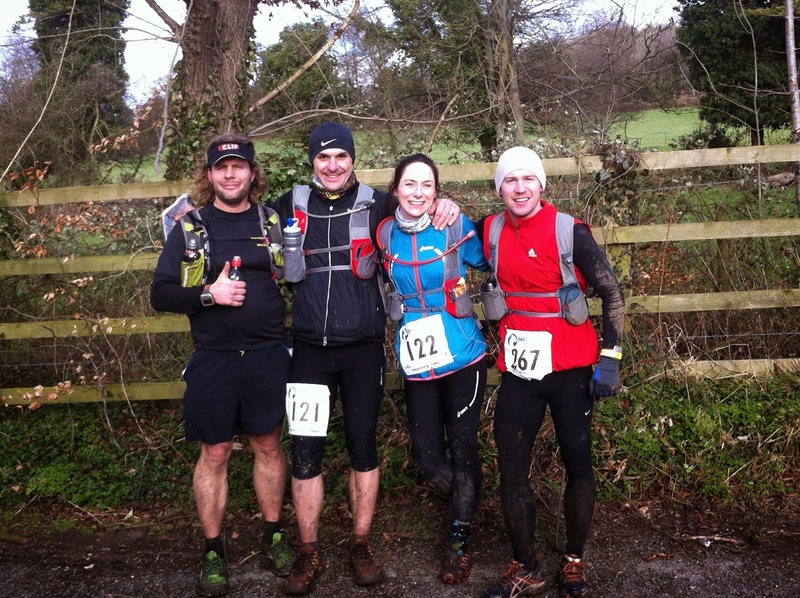 I completely credit Taff with being the inspiration for me getting into Ultra running. 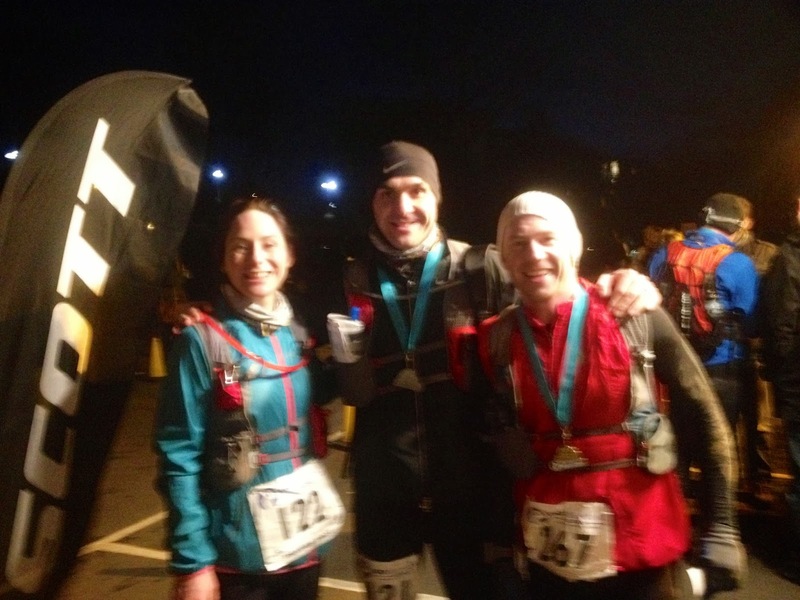 He’s written a brilliant blog post on hitting the 100+ mile mark at Thunder Run 24. A group I belong to on Facebook is the Dirty Daps, Muddy Tracks group and I’m one of the tamest, least experienced members. 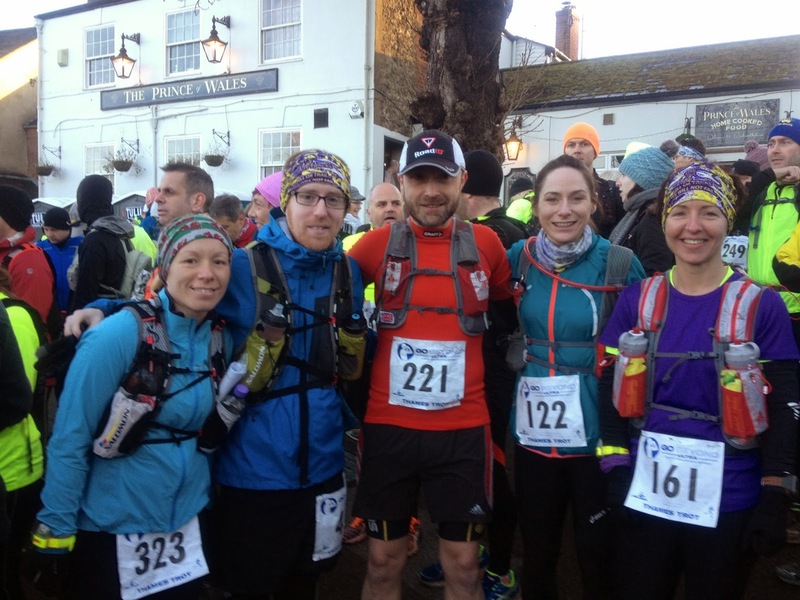 These guys are ultra marathon, mountain running, crazy people and I was meeting up with Al Davies, Sammi Toop, Gary Broughton and Jackie Hislop before the start of the race. The DDMTers are recognisable by our yellow and purple buffs and today was Jackie’s birthday, so she was celebrating by running 50 miles. See ... Completely mad. But in a good way. A quick hello and a smile for a photo and I was off to find the loos. The Dirty Daps & Muddy Tracks! I could follow my nose to the loos as despite the fact that these were in a pub, they had already gained the unmistakeable 'race loo' aroma. However considering my next 10 hours or so was to be on the trails and the next convenience was likely to be a thickly leaved hedgerow I decided to make the most of them. Andrex rather than Big Leaves? Yes please. The recent heavy floods had meant that a lot of the Thames Path was underwater. Well not just the Thames Path. 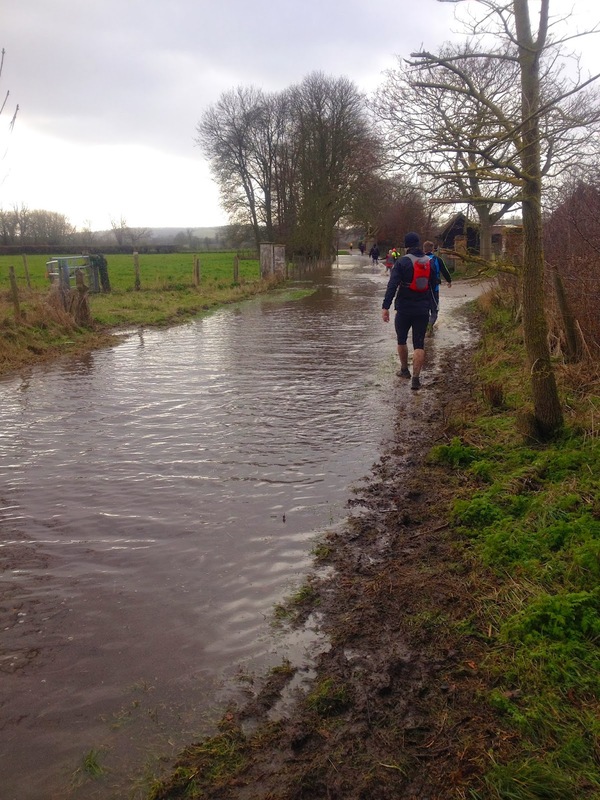 Most of Oxfordshire and Berkshire was soggy, so this run was no longer the simple 'follow the Thames Path' route I'd hoped for. There were a lot of diversions in place with the start, checkpoints and even the finish being moved. A lot of the race was to be on roads now. 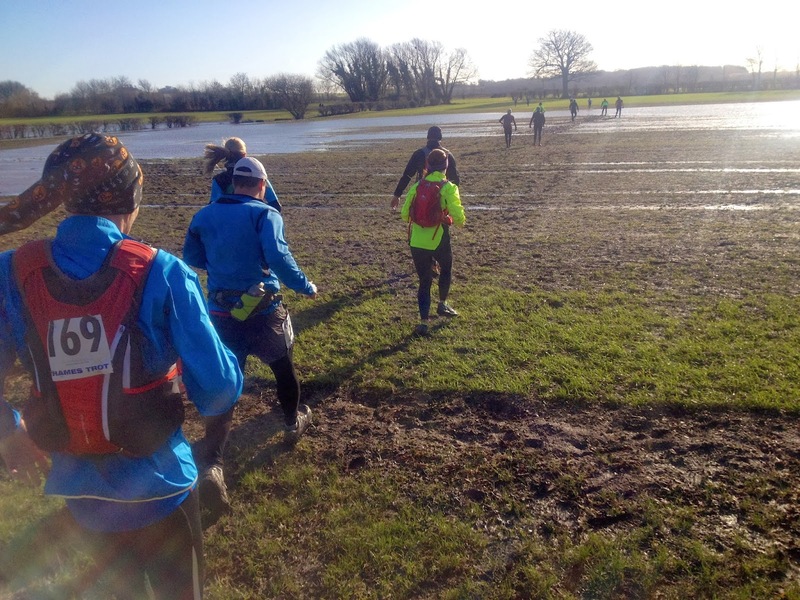 This wasn't entirely unexpected as the flooding had been pretty widespread and the Go Beyond Ultra website and Facebook Page had been viewed regularly by the race entrants as there was speculation as to how the organisers Go Beyond would handle this. To their credit, rather than cancelling the race which would have been the easy option, they issued updated maps multiple times as the flooding increased and they even did a course recce on the race morning to check flood levels. So as well as the map book, supplementary map book, there were also additional diversion instructions on race morning. It was a friendly start. No people zigzagging, trying to push their way in front of others like in shorter races. It was laid back, friendly and slow. We all knew there would be plenty of time to settle into our pace. No need to twist your ankle or drop your snacks within half a mile of the start. There was a diversion from the very beginning which set us out onto the roads. After about half a mile we passed a sign for the Thames Path. Looking over the fence as we ran past, we could see the field beyond the sign was a shimmering mass of silver water. Despite running on the road, I was glad to have worn my trail shoes if that was what was waiting for us on the paths ahead. I was running with Paul and Rod at our 10 min/mile moving pace. To our credit we managed to maintain it for the first 2 miles before lapsing into a much more natural 9 min/mile pace. We exchanged shrugs. We tried it. We would probably be slowing down towards the end whichever pace we ran now. It was how MUCH we slowed down that was the important thing. The miles flew past as we chatted about upcoming races and our training prep. The pretty villages and lanes passed by like a Scooby Doo background. We had a few wondering glances from the car drivers, but most were friendly and we had a few horn toots and waves. A middle aged woman in a Range Rover was one of the few idiots we encountered while we were running through one of the villages. We were on a wide road with puddles, but she sped up and aimed for the water in an attempt to drench a group of runners. Luckily her shoddy driving extended to control on wet roads and she failed to splash anyone. It was lucky really as large groups of damp runners flinging themselves at your vehicle in a fit of rage tends to offend the occupants. Still it was the one example of mean spiritedness that I saw on the entire run. The majority of the drivers were courteous and safe, especially considering the roads were being taken over by a group of neon clad lunatics. This woman was the one idiot. Well ... if you exclude the 250 people running 50 miles. The miles between Oxford and Abingdon disappeared in a blink and we were running over the bridge over the Thames in Abingdon in the morning sunshine early and looking out for the 1st checkpoint in what felt like short minutes. Looking over the stone sides of the bridge, the extent of the flooding was suddenly more apparent, with rows of trees in what appeared to be the middle of the river. Gardens and hedgerows and entire fields had been swallowed by the greedy Thames. It didn't bode well for dry feet in the later miles. Coming up to checkpoint one at the 8 mile point, there were already lots of people stopped and stretching out their legs and calves. This surprised me. Maybe it's a tactic for maintaining flexibility with 40 miles ahead of you, but it looked to me as though people were preparing to stop. This was all before checkpoint one. 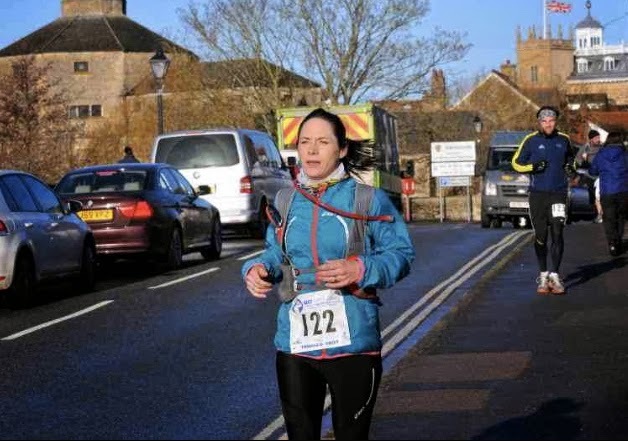 I had assumed if you had an injury you wouldn't attempt a 50 mile race. However, this was all new to me. Maybe this is what the experienced guys did. The stretching, not the dropping out. I had practically the entire contents of my kitchen cupboards in my race vest in a fit of newbie enthusiasm. Don't ask me. 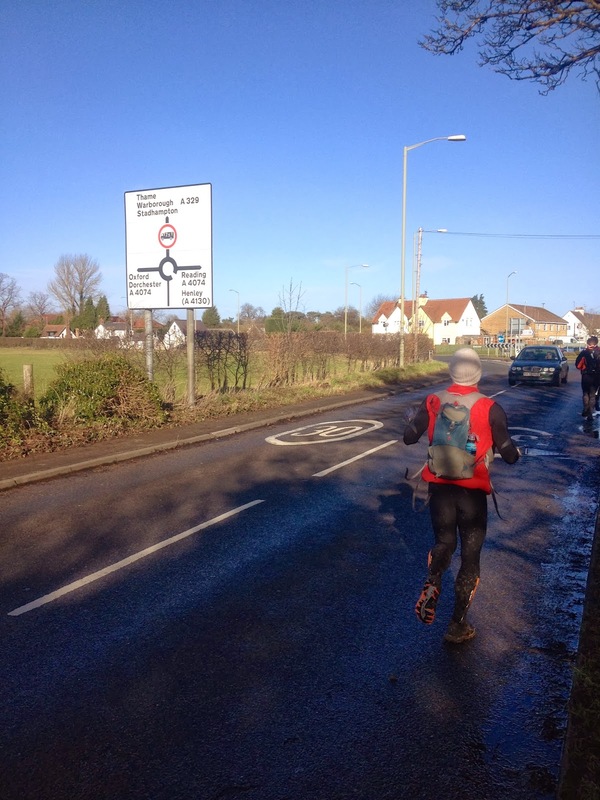 We were getting a bit worried as this was about half a mile past where we'd expected, although Paul with his sharp eyes spotted the 'Go Beyond Ultra' quill flags which were to be our first notice of a checkpoint. We bleeped our wrist chips, took a quick photo and carried on. Running along the pretty streets of the town and looking over the bridge at the flooded river, the photographer snapped a pic of me. I look moody and brooding in the picture, as though I'm thinking deep ultra running thoughts. In fact, I'm actually wondering whether it's too early to start on the crème eggs. As I came across the bridge and onto the high pavement, I heard a shout! That's my name! I looked around and my Endure 24 teammate Rob was cheering me on! It gave me a big boost! 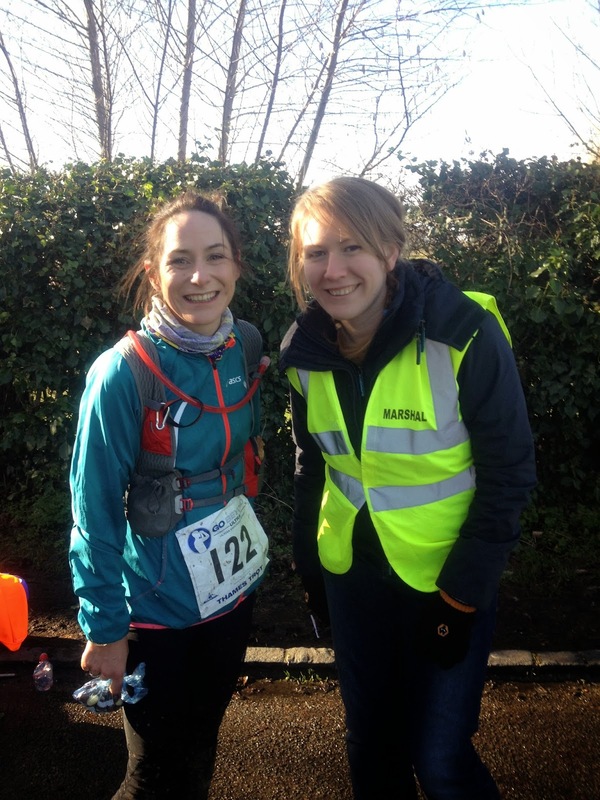 It was lovely to have someone supporting me and was great for morale! I grinned for the next half a mile. Right up until I managed to get my feet wet for the first time. There were lots of puddles in our path but mainly minor ones. 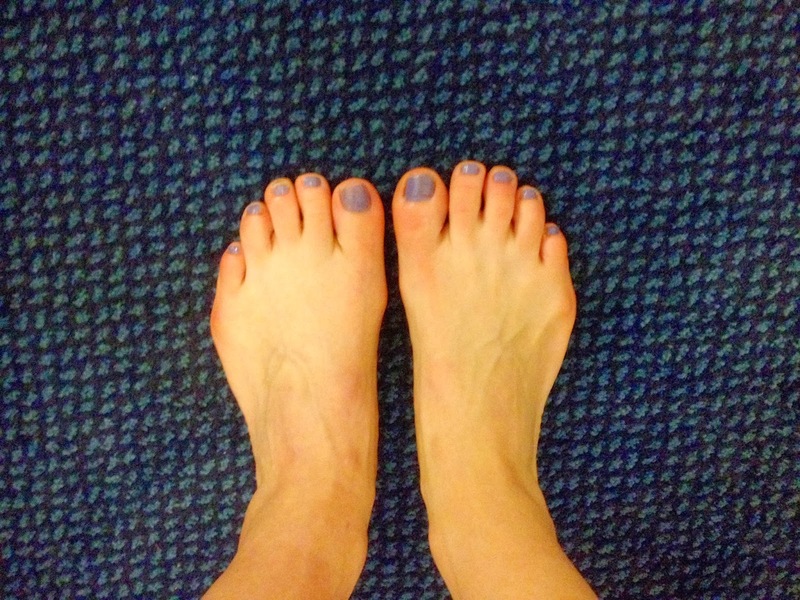 I'd managed – mainly by pure luck – to keep my feet dry until this point but it was time to christen the toes – with their fetching violet toenails – with some Thames river water. Like a cold, muddy ultra running baptism with added Weils Disease. We were all running well and although we were going for the long haul – to finish, not to place – we were overtaking people steadily. We all felt fresh and full of beans. Or in my case full of yoghurt-covered-banana-coins. I’d decided to go with the Constantly Eating strategy. This wasn’t one I’d heard of previously but it was keeping me happy. Plus every snack I ate lightened the weight of the pack. Sensible, right? Coming out of the villages, we had a view over the flat fields on either side. Water shone silver and the road had large puddles in it but the morning was bright and clear. It was perfect running weather. I had a chat to a chap running a similar pace who lived along the route at Wallingford. As he was local, he had been running the Thames Path regularly to train but his usual routes were now a couple of feet under water. The scenery was pretty but the area was very flat - just one hill visible in the distance. He mentioned he had to run 2 miles to find any gradient for hill training. Great for speedwork though I imagine. Apart from having to jump the puddles. The road running didn’t last much longer. 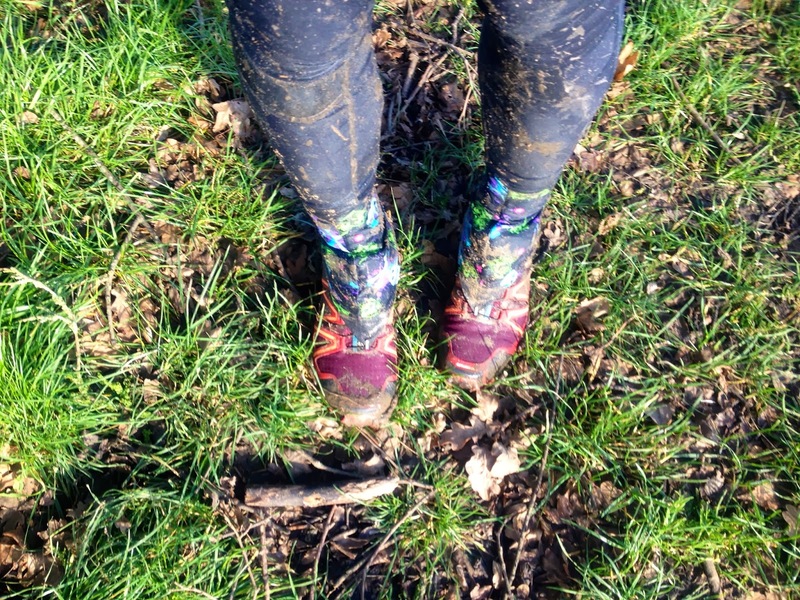 We were into rural Oxfordshire now, following a footpath and we found our first section of ankle-deep mud. 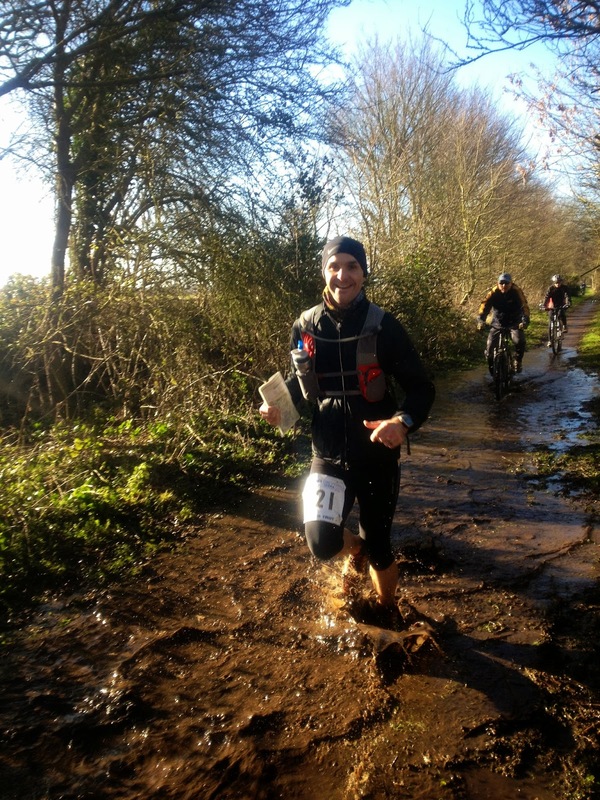 Paul revealed a hidden talent which was to find the deepest part of any puddle, muddy bog or stream. It was quite handy. You just watched which way Paul went and DIDN’T follow him. We had a brief detour around a farm followed by about 10 people which was handy when we realised we’d all got lost together. Luckily a villager directed us towards the church which was one of our landmarks. We were so enthusiastic about finding the church we barrelled on past and were redirected by some spectators who helpfully told us “The other lot went THAT way...” Pointing up the only hill in the area. The hill was a bit mushy, but I made up a bit of time by not following Paul and soon the path led into the woods. It was pretty with a wide path and the bright blue sky made it a lovely day for running. However, all of my attention was taken up by the ankle deep, shoe sucking mud. We sploshed along, running as much as we could and walking when we couldn’t and talking the whole way. Rod kept smiling, his good humour not deterred by the conditions underfoot. We turned right onto a grassy track up the side of a hill and I slowed to a walk. I had about 40 miles to go, I wasn’t going to tire myself out running up muddy hills, when I could walk up, NOT twist my ankle AND have a snack on the way up. We caught up the people who had run up the hill at the top and joined in the debate about the correct route. It was unclear on the map. We knew we had to get down to the river but a steep drop, brambles and a lot of trees were blocking our way. We chose a route at random and ran along the edge of the field, Rod aeroplaning down the hill with his arms out while Paul tried a speed interval. We traversed a very steep drop down to a lane below which we took at top speed and in fell runner style and arrived breathless and laughing at the bottom of the hill which opened out into a lane and a view of a bridge with high arches. Henley appears on the signs! We crossed a busy roundabout and back onto the pavement next to the main road ... then in the distance. Is that a Go Beyond flag? It was! Checkpoint 2 was in sight! Heard a shout and saw The Mister and Mischief waving madly! Waved back just as enthusiastically and claimed a damp kiss from Mischief and ran on to Checkpoint 2. Mischief shouted something after me which I didn’t catch. “I SAID I’ve got BOGIES, Mummy”. Ah. The joys of 4 year olds. The checkpoints seemed to ignite a lemming-like response in some of the participants and they were crossing the roads as though magnetically drawn to the Checkpoint flag rather than keeping an eye out for those high-speed, wheeled metal objects that were whizzing down it in both directions. As promised, the lovely Mary of A Healthier Moo was marshalling at checkpoint 2 and she had a veritable display of goodies including the famous Go Beyond cake and jelly babies. I had to decline this bounty though as had eaten an entire bag of chocolate bananas and was already halfway through the stash of flapjacks and wasn’t convinced I would be able to eat any more and still keep moving forward. We were sick of running along main roads at this point and I was wearing my trail shoes in expectation of a bit of nice trail .... And soon my optimism was rewarded. We turned into a footpath which turned into a muddy cow path which turned into a muddy bog. With extra puddles. We gave up avoiding the puddles and just ran through them. There were a few close calls, then suddenly we heard a noise and Paul was down. He’d taken a tumble and twisted his knee. He got up, brushed himself off and carried on running, wearing the mud on his clothes and hands as a brown squishy badge of honour. We passed walkers on the path several times. In heavy jackets and wellies looking at us as though we were completely crazy as we ran past in bright lycra, running vests, shovelling food into our mouths. We were soon gone though, only the footprints in the mud and a dropped yoghurt-covered cranberry to show where we’d been. It was nice. Muddy, yes. Slippery, yes. But trails and quiet lanes. Much more fun to run than pavements and busy roads and .... we ground to a halt. We’d found a bit of a puddle. Well. Slightly more than a ‘bit’ of a puddle. It was a LOT of a puddle. I was definitely going to get my feet ... and calves ... and knees ... wet in this one. I gritted my teeth and stepped in. It was bloody cold. While running, I’d been nice and warm but after a few hundred metres of wading through chilly water, I was freezing and my feet started to become stiff and painful from the cold. When I managed to escape from the water, the last thing I wanted to do was run but encouraged by Rod and Paul I did and my feet which had felt like ice cubes started to warm up. 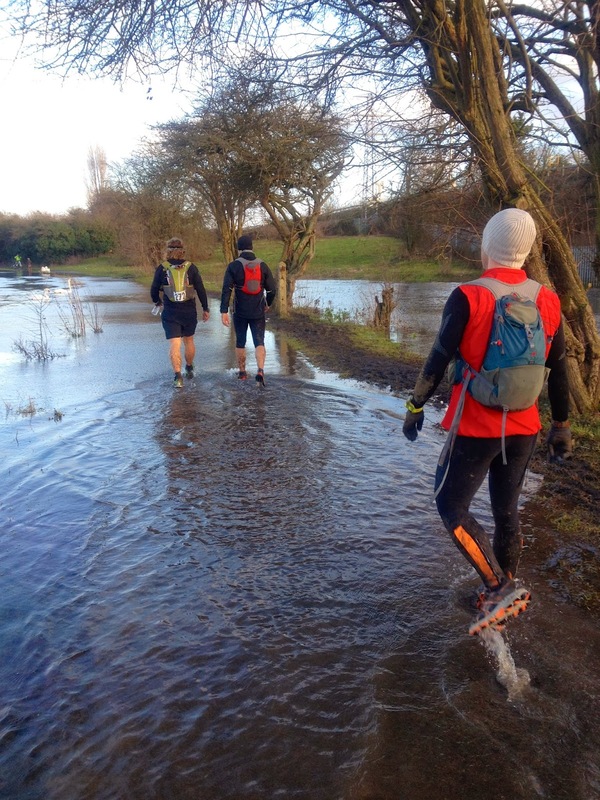 We ran on and with the water draining from our shoes and our feet slowly thawing, we realised we’d battled the river – well … a small portion of it – and won through! We’d escaped the Old Man of the Thames. With perfect timing, it started to rain. We sighed. Well, our feet and legs were already wet. May as well completed the drenched look. CP3 was on the A4009 at Cleeve (Nr Goring) 24.6 miles although due to our scenic route this came at about marathon distance. We were clapped into the checkpoint by spectators and it was good to hit the marathon mark and still feel so fresh. I was trying not to think I still had to run another one. We had a brief snack at the checkpoint taking a selection of the bounty offered which included the famous cake, cocktail sausages, jelly babies, sausage rolls and scotch eggs. The checkpoints also offered energy drinks, but they were ones I hadn’t tried before and I thought that halfway through a 50 mile race probably not the best time to try something new. Unless I wanted to christen every hedgerow between here and the finish. The checkpoint was in a small town at the top of a hill. A railway was running on our right but it was peaceful and quiet. We ran on towards the woods, following the signs for Gatehampton Manor. 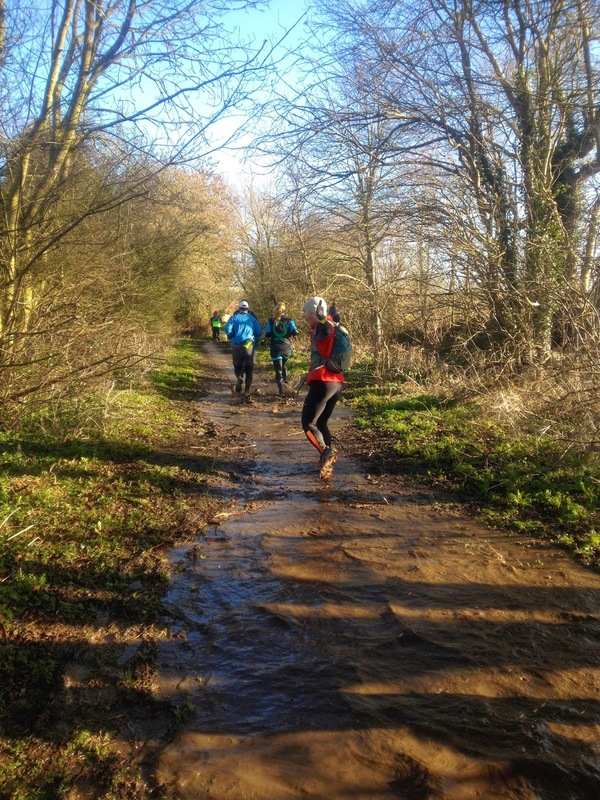 The muddy path opened out onto fields and then unexpectedly we were running on beautiful undulating trails. The Thames was on our right, far below – a gleam of silver through the trees and we ran through woods with silver birches and high stony hills on our left. The trail was full of small steep hills and the dirt path was soft beneath our feet. The perfect remedy to miles of road running. CP4 This was in Mapledurham at about 32 miles. Coming around the corner, we saw a crowd of people who cheered us in like we were celebrities. I glanced over my shoulder to check that Dean Karnazes or Scott Jurek weren't running behind us. Nope. This was for us. Wow! I needed this checkpoint and filled up my water bladder in the ultra vest taking care to drop an electrolyte tablet into it. I know I shouldn’t do this (apparently stains the water bladder) but I don’t want to carry water AND sports drink. It's pure laziness. 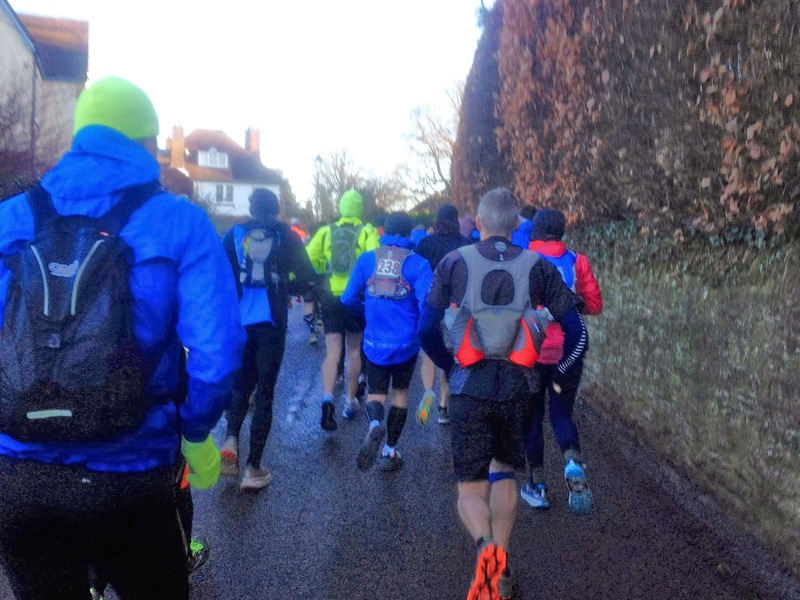 We also knew we only had one more checkpoint before the finish line and rather than thinking “We've got 14 miles to go,” we said, “It’s an 8 and a 6 mile run – those are tiny distances! We can run those easily.” It was a lot easier breaking the distances down into bite-sized chunks. As is typical, the way forward was UP a steep hill. 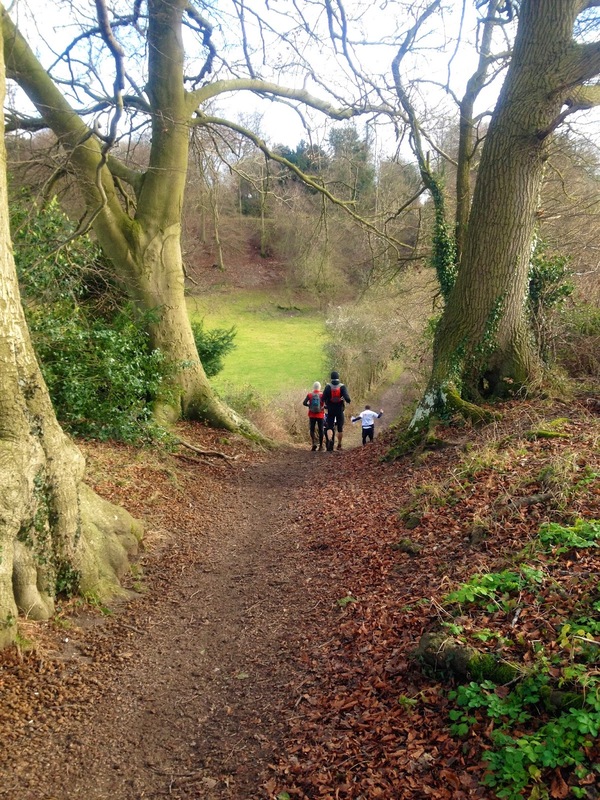 So employing that well known – and cheaty – ultra runner tactic we walked up the hill. The path led through a housing estate and wound up towards a set of steps. It felt like we were climbing towards the sky. We emerged onto a main road and up towards a pub where an elderly man directed us down a set of steps towards a railway bridge. We weren’t sure whether he was a marshal or had wandered out of the nearby pub. However, he seemed pretty sure that this was the way so we decided that we'd go with it. We crossed the railway bridge just as a train approached and we waved at the train as it passed underneath. We got a big cheery wave from the train driver too. Encouraged by the thought that Midland Rail was clearly on the side of ultrarunning we followed the steps down to the Thames Path proper. The Thames was now on our left and we just had to follow the path for a few miles now. The path was a gravelled surface with regular puddles. I didn’t want to dodge around avoiding puddles so I tried to pick the path of ‘Least Puddles’. Unfortunately the rest of us were also trying the same so there we were, all bunched in the middle of the path, hopping puddles in unison in an attempt to keep our feet dry without falling in the Thames or knocking a fellow runner in the river. It was like Riverdance but in lycra and trainers. An finally ... an undodgeable puddle. In fact, the Thames. Everywhere. There was no way of staying on the path without a boat. Or at the very least a armbands. We spotted a ‘Go Beyond’ arrow and followed this to be diverted onto an industrial estate. It was grey sky, grey roads, grey pavements and grey buildings. We were back onto roads and pavements and lines of cars that queued and queued. The occupants staring out of the car windows at us as we passed. Wondering what on earth we were doing with our muddy legs and running packs as we traversed the industrial estates of Reading. We went past the Rivermead Leisure Centre and memories of a swimming pool like soup on Reading Festival Weekends. Very different to today. Remembering hot summers, mosh pits and living on pot noodles. Today? River wades, 50 mile runs and living on chocolate coffee beans and snacks. A different adventure. Paul had been doing a brilliant job navigating us and was keeping an eye on our pace. We didn’t want to run too fast but didn’t want to miss Checkpoint cut off times either as we’d automatically be disqualified. He checked the average pace and concluded it seemed a bit slow. “It’s 11 min /miles” he announced. This was surprising as we’d been running virtually a metronomic pace over the last few miles of Thames Path and industrial estate pavements. Hmmmm. Then it clicked. The pace included checkpoint stops. And the river wades. AND our multiple ‘photo-or-it-didn’t-happen’ stops. Suddenly 11 min/miles sounded very respectable. The pavements disappeared and we were dodging cars on the road. Under a bridge and out of the other side avoiding traffic and puddles. No other runners had overtaken us for miles and we were reeling people in and overtaking them regularly. 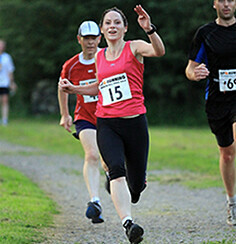 Everyone had settled into their paces now and the runners were strung out all along the course. Occasionally we’d see someone in the distance in front of us, we’d run with them for a while or overtake with a greeting and then we’d be alone again. The loneliness of the long distance runner. I was glad to have Rod and Paul running with me. Even if we were silent for periods of time it was nice to know they were at my shoulder. Their pace matching mine and their footsteps echoing mine. Is she taking pics AGAIN? Directed by the most well-spoken security guard in Reading, we cut through the industrial estate and back onto the Thames Path. The river was wider than a field and the branches peeking through the surface showed where it had swallowed gardens and parks. We caught a flash of blue and caught up to a girl who was walk-running on her own. We ran with her for a bit but she told us to go on ahead as she was comfortable walk-running. She declined our parting gift of Pick’n’Mix sweeties and we carried on down the path. The path appeared and disappeared under the water and it was a gamble how deep it was. In the Thames, on the path, in the Thames, splash through the Thames ... 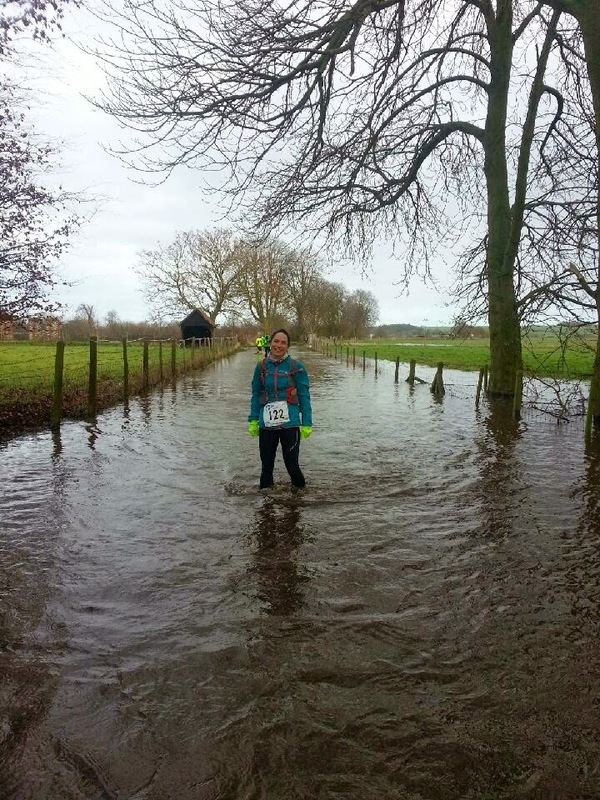 In some places it was fine – the water was only an inch or so deep so we ran through it, our feet splashing like children running through puddles. In other sections, it was calf deep and the ground was slippery so we walked, our feet quickly becoming cold from the water of the Thames. The water cut off the path entirely at some points and we had to divert into ornamental gardens and across temporary bridges erected by the council. Crossing one of these, I was careless with my step and slipped on some mud at the bottom. Splat. My own muddy brown badge of honour on my hands and leg. Rod was now the only one who hadn’t tripped or fallen – a testament to his balance and careful footing. However also the only one now not wearing mud. We threatened to push him in the Thames if he didn’t join the muddy gang. Back onto the Thames path and past a man teaching his daughter to kayak. He showed us a cut-through on the bank to avoid the flooded path. Back onto the path, the water splashing up around our ankles. We trotted onwards and towards a man and his 5 year old son, on their bicycles waiting for us to pass. The man shouted ‘Ready, Steady ...’ to his son as they cycled towards the innocent-looking puddle. Don’t think they realised quite how deep it was. Suspected he had a bit of explaining to his wife when he got home and handed over a drenched, bawling child. One last section of wading, ice cold and toe numbing and we were onto a bridge and back onto a busy main road. There was no pavement and cars were whizzing past. Luckily the majority of the drivers appeared to be runner friendly - or didn’t want to pay the excess on their insurance for dented bodywork - and gave us a wide berth. This was lucky really as by this point we had our heads down, knowing that the next checkpoint was close. Big speeding metal objects on wheels? Meh. CP5 was on Play Hatch roundabout on the B478 from Sonning. This was the last checkpoint before the finish line and they had a lovely spread of food: cocktail sausages, sausage rolls and The Cake. I wasn’t interested in this though. I asked Paul for a hand and he fished around in my backpack and came up with what I wanted. A purple, red and gold orb. Shining in the evening sunshine, I perceived it with a reverent air. My crème egg. I’d like to say I savoured it, but it’s probably more accurate to say I inhaled it. I had been thinking about this crème egg since about mile 6. Now at the 40 mile point ... it had been worth the wait. I heard a shout and saw The Mister. Mischief was in the car looking a bit green and wearing her pyjamas. “Pyjamas?” I queried. Apparently she had said she felt a bit sick and wanted a cuddle. The Mister had turned round to give her a cuddle and she had vomited into his outstretched hands. “At least you caught it!” I said helpfully. I gave him and my vomit-smelling daughter a quick kiss and started the trudge up the hill towards the finish line. The final section. From the checkpoint we were straight up a steep hill. We kept in as much as we could but it was a narrow road without a pavement. The drivers were courteous though and a bus stayed behind us for a while waiting for a safe place to pass. However, the ‘Face of the Day’ award was given to a chap staring through the rear window of the bus. Clutching a McDonalds milkshake in one hand, he glowered at us. How dare we hold up his bus when he had a milkshake to drink. Stupid ultrarunners! The hill wound onwards and upwards for what felt like miles, then down the other side winding through a village. It was dusk now and lights were starting to appear in the windows. We carried on down the lane and a ‘Go Beyond’ arrow appeared in the hedge. Pointing down a rutted track. The map clearly said not to turn here but who are we to argue with the yellow arrows of obedience? We followed the track and came to a crossroads. Standing looking at the different options as though an arrow would drop from the foliage above our heads, we finally concluded a magical sign wasn’t going to appear and we carried on straight ahead. 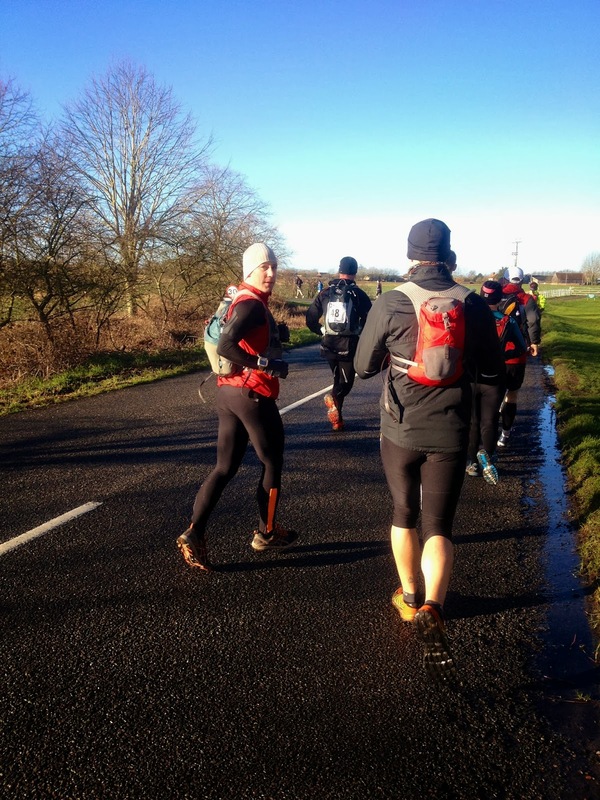 As we ran, we chatted to another runner, an experienced ultrarunner called Paul who had run several ultras before and was now looking at doing a few more multistage events. He’d already completed the Marathon de Sables, another desert run and was looking at a race in Andalucia. Wow. We were running in a pleasant wood now, but the light was fading and the trees were blocking what little light was left. I switched my headtorch on. It was mile 43 – we’d almost made it to the finish line without needing it but the tracks were too broken and potholed to risk it. I’d come this far without damaging myself. It would be a shame to lose all my front teeth 5 miles from the finish. sodden and our shoes squelched as we ran. We crossed a bridge and the ground disappeared under about a foot of water. A meadow, ridiculously flooded. There were clumps of grass sticking up above the water and the ground underneath our feet was unstable and uneven. Miserably we waded and wobbled through the mire. Unable to lift our feet above the water, our toes cold and our clothes sodden. I kept my head up looking for a dry piece of land. The field was deceiving. I kept thinking I could see dry sections, but each time I got there it was as wet and miserable as the last section. It was like the complete reverse of an oasis in the desert. Finally we got to the field edge. It was mushy but walkable. Then trot-able. And finally ... back to a run. Well a shambling, damp run. Paul, Rod, Paul 2 and I pulled ahead of the others and we finally got running again. We crossed a bridge at the end of the path and stopped. We could see where the Thames Path should be, but in ahead of us was just water, black and dark. The seats and backs of benches stuck up above it and the tops of litter bins but no path was visible. The bloke running behind us stopped. “F**k this.” He said and retraced his footsteps, sloshing back through the water. We’ll have to turn back. We looked at each other. There were no diversion signs. This is the way the map said. But the flooding has obviously got worse. Do we risk it? We looked at the blank, black water. We could see where the path WAS judging by the tops of the benches and the bins curving around by the line of the trees. We just couldn’t see the actual path. We exchanged glances and stepped forward into the dark water. We realised that we needed to be very sure of our steps. There was grass underfoot on our right and the riverbank dropped away to the bed of the actual Thames next to this. We kept the line of bins and benches on our left and pushed on. The water rose to our calves, then our knees. Ahead we could see lights on a bridge. On our left and right we could see only stretches of dark water and the outlines of moored boats and dark houses. Out of the 3 of us Twitter buddies, Rod was the only one who hadn’t fallen over in the Thames mud, therefore I had to be content with leading him through the river instead. We spotted a white light on our left, moving between the trees and the tops of the benches. It slid alongside us smoothly and we realised a kayaker was paddling deftly over the drowned park, where months previously people had been walking their dogs and playing with their children. We waded along. “Seen any other runners coming this way?” He shook his head. We waded onwards. At this point I started worrying. I was leading the others onwards and there was no sign that the water would recede and reveal the path as we’d hoped. Our legs and feet grew colder and we followed the very tops of the benches. Is the water getting deeper? More importantly, had I led the others into danger? Suddenly. “Is that a car?” We looked to our left and like an island in the water, a car. An actual car. In a dry car park. Woo!! We waded towards it, emerging from the water like a herd of Creatures from the Black Lagoon and were standing on a dry tarmac car park. “Is that a GAZEBO?” Asked Paul. We craned our necks. A gazebo? Like the sort of gazebo that would hold medals? And be standing next to a finish line? It MUST be! What other bloody lunatics would have a gazebo up at this time of year? And next to an entire underwater town? We sprinted towards it. Well. It felt like sprinting but I imagine it looked a lot like shuffling. We speed-shuffled like a group of eager pensioners spotting the last bingo ticket. Hang on. Does that say ‘START’?? We looked at the giant inflatable arch. It did indeed say ‘start’. Don’t tell me there are TWO races going on in the dark in Henley-on-Thames? Nope. We’d just appeared from the wrong direction. We shuffled around to the correct side of the inflatable and ran across the line. I was an ultra runner.